Our gorgeous Billie is a 3D original which is been reproduced to perfection as a Giclee offering. The original is currently not on the market. 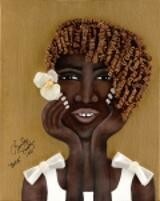 As a Giclee reproduction our dark skinned beauty is artist enhanced on canvas and presented in a series of 750.